Modern economies need courageous, bold and entrepreneurial individuals to thrive yet the same qualities can bring greater risks according to a world-first study from an international research team. QUT's Associate Professor Martin Obschonka, Director of the Australian Centre for Entrepreneurship Research, joined forces with researchers from Germany's University of Mannheim and the University of Cambridge in the UK to study data on courage from more than 390,000 Americans. The project was a collaboration with Time Magazine which collected the data gathered from an online Harry Potter-style sorting hat quiz publicised on its website. The findings—Regional Variation in Courage and Entrepreneurship: The Contrasting Role of Courage for the Emergence and Survival of Start-Ups in the US – have now been published by Wiley's Journal of Personality and represent the first study ever to map out differences in the prevalence of the personality trait courage in regional populations across the USA. "Our modern society often requires some sort of courage/bravery/personal agency to cope with the uncertainty of our times, which present us with less clear career paths, extreme technological change, lots of societal challenges and other unsettling trends," said Professor Obschonka. "Those same personality traits are able to take advantage of the unprecedented opportunities that now exist to foster creativity, entrepreneurship, 'changing the world' via innovations, global exchange, use of new technologies, and the development of fascinating new products and services." However, as lead author Tobias Ebert from the University of Mannheim said, the study results indicated a double-edged sword. "Courage seems to contribute to more economic vitality in a region with more entrepreneurship rates and more start-ups. This finding supports the general assumption that it requires brave people to drive modern economic activity, compared to historical times when it required a workers culture to stimulate the economy with its large industries and factories, said Mr Ebert. "The dark side to courage is that we found evidence it is associated with risk-taking and higher start-up failure rates." Professor Obschonka said this tendency could be called 'blind' courage which may undermine a realistic evaluation of risks. "In other words, a too strong courage might increase uncertainty and risks. So educators, policy-makers, entrepreneurs etc. should keep in mind that while promoting courage can be a powerful tool in growing a local economy, it can have a down side," he said. 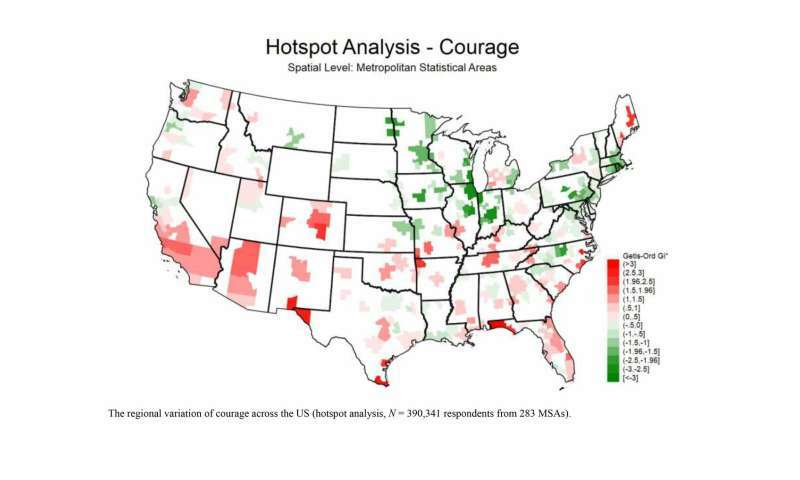 A map produced for the study revealed pronounced regional differences in Courage across 283 US metropolitan areas. Areas with comparatively high levels of courage are found in the Eastern and Southern regions of the US (from California, Arizona, Utah, Colorado, New Mexico to Texas and Oklahoma) as well as the state of Florida. Areas with comparatively low levels of courage spanned eastwards from the Midwest, including the Dakotas, Minnesota, Iowa, Nebraska, Missouri, across the Rust Belt (Illinois, Indiana, Pennsylvania, New York, New Jersey) up to Boston and down to the Carolinas. "Regions with elevated levels of courage show higher start-up rates so findings suggest a lack of courage within local populations might be an important driver of the consistently weak entrepreneurial dynamic in areas like the rust belt," said Professor Obschonka. "Yet companies founded in these courageous regions demonstrated a lower share of start-ups surviving the first five years after foundation. Findings suggest that excessive courage within local populations comes at a cost and might contribute to an overheated regional economic climate."